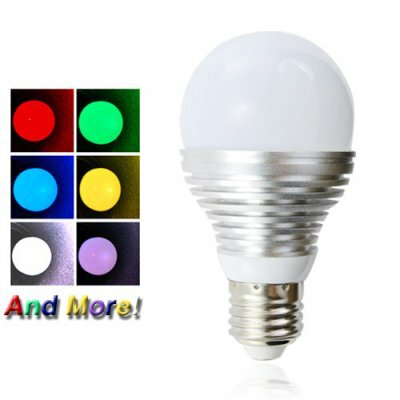 Successfully Added LED Color Changing Light Bulb - 16 Color LED Lamp with Remote to your Shopping Cart. The newest offering in our famous series of Color Changing LED Lights. This new, second generation high output 16-color LED light bulb provides an astounding 60 lumens per watt, giving you an amazing brightness while using only 3 watts of energy. Better still, this multi-color LED light bulb conveniently fits into any incandescent light socket. Do you have a sign, wall or room currently illuminated with boring white light? Own a small business and want to really make your space stand out? Well here is the lighting product you have been waiting for - the 16-color LED lighting bulb with color effects and remote! This LED light can be used in a single static (fixed) color or simply press the remote control to produce one of four color changing effects. The CVHZ-G82 is capable of emitting White, Red, Green, Blue, plus twelve additional bright colors. In addition to the brilliant colors you can produce with this light bulb, you have the added benefit of reducing your energy costs since this bulb uses only 3 watts of energy. Great for retrofitting into existing track lights, downlights, pendants, wall sconces, or table lamps, make your interior decorations and displays shine with this one of a kind LED color changing RGB light bulb brought to you direct from the factory. Yes it is. Our model 8101 is a directional light while this model, G82, is for general ambient lighting. Dropshippers - Our current series of color changing LED bulbs has continued to be popular since we introduced them last year. This is a product that will net you some steady sales from people looking to embrace LED technology. Resale Partners - save on your overall product cost by ordering this in at least 4 pieces in order to receive the absolute best value for your money; better price + better per unit shipping cost = better savings for you! Nice bulbs.... got 2 of them i got them in 4 days (Netherlands). They give a lot of light and the colors are nice. The remote works also from 5m (sitting on the couch and the bulb is on top of the closet (out of sight)).